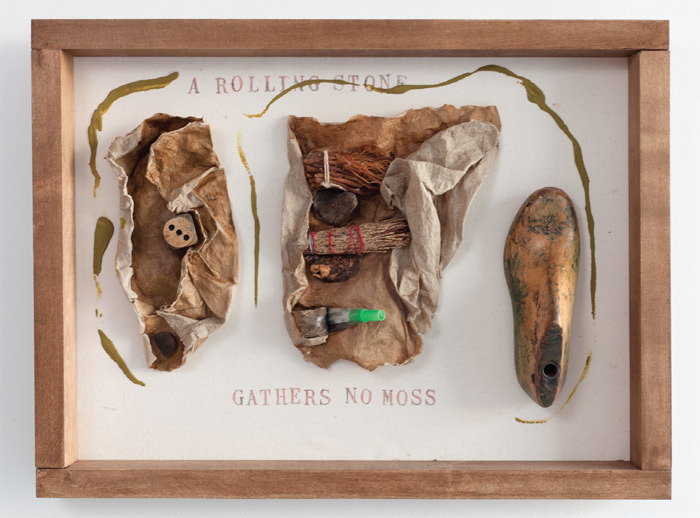 Alison Knowles, A Rolling Stone Gathers No Moss, 2011, found materials, acrylic, raw flax, hand stamps, raw cotton, maple, tea-stained frame, 17 1/4 x 22 1/2 x 4". 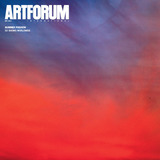 Best known for her role as a founder of Fluxus some five decades ago, Alison Knowles has produced a remarkably multivalent yet precise body of work during the course of her long career, working in painting, sculpture, performance, sound, and in various ways with the printed and spoken word. For many years, I associated Knowles with beansyes, those ubiquitous and overdetermined foodstuffsbecause they so often appear in her performances, as do other such everyday materials. Like some figures with whom she is often associated (Marcel Duchamp and John Cage, for instance), Knowles can be seen as plumbing the otherwise unremarkable, anointing the banal with the moniker of Art, and, in so doing, giving the low, the fleeting, and the prosaic a momentarily different shape.